Cytokelp is an organic-based plant biostimulant that contains the natural plant growth stimulant Kinetin, as well as Yucca Extract, and is derived from kelp extract - a natural source of cytokinins, auxins and gibberellins. Kinetin, a cytokinin, is native to many plants, and acts as a growth rate stimulant by stimulating cell proliferation and differentiation. When applied exogenously, Kinetin can funnel resources toward the rapid growth of shoots and leaves. Yucca is a natural surfactant and wetting agent and improves crop resistence to stress. 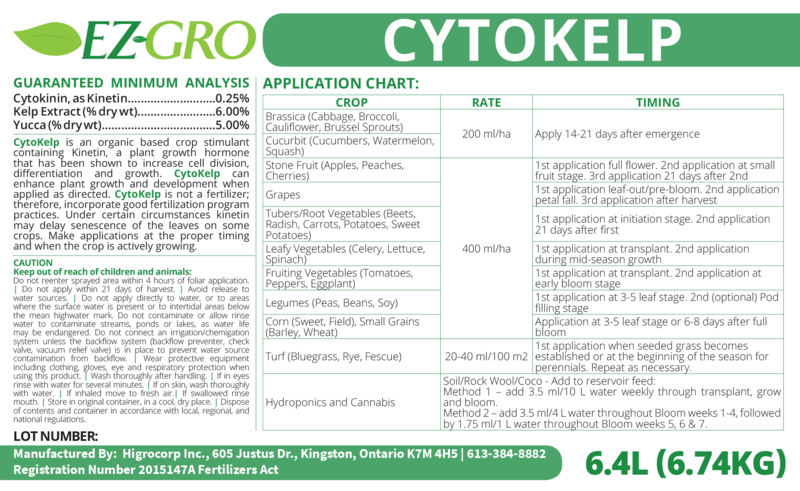 Reduce transplant shock, increase number and size of fruits, flowers, grains and pods, improve crop yield and stimulate rapid growth of your crops by using Cytokelp. • Kelp is a source of organic potassium, minerals and contains natural biostimulants such as cytokinins, auxins, and gibberellins.